FAKE Sedwick County Deputy Brian S. Etheridge Stars in Natural Born Killa Richard Lyons’ Daring Suicide Bomber Style Ambush; Is It: "Protest of Year?" 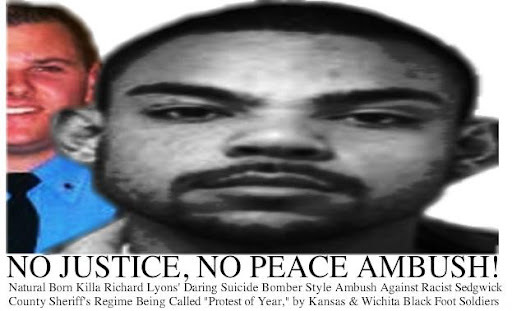 Sedgwick County, Kansas & Wichita Black Foot Soldiers are calling Richard Lyons’ “suicide bomber” style protest against the regime of the racist Sedgwick County Sheriff’s department the social action protest of the year. “It’s reminiscent of the courageous demonstration of brother Jonathan J. Thibodeaux in 2007,”says NBFSN spokesman Cedishon Angelou. Lyon’s demonstration, along with reports of two coordinated robberies that, according to sources, may be nominated as Reparations Protests at two local businesses, is also receiving recognition from the National Black Foot Soldier Network. “It’s a suicide bomber style protest and reminiscent of the courageous demonstration of brother Jonathan J. Thibodeaux in 2007,” says NBFSN spokesman Cedishon Angelou. While Lyon’s family has issued an apology to the Sedgwick County Sheriff’s Department, the state’s Penitentiary Islam elders say Lyon’s was chosen by Allah to fight the devil. “Tell my family I love them. I’m going to get my virgins,” unconfirmed sources allegedly close Lyon’s inner circle says the new urban icon said before the accused ambush.